As holiday gatherings approach, and we begin pondering how to feed the friends and family masses that we will host over night, it’s easy to let the fear of “what will they eat, what if they don’t like it, how will I do it all” steal our joy. We begin to think that maybe it wasn’t a good idea to host after all. Well, I love serving large groups in a “bar” type of line up. Yes, one of the easiest ways to begin the bustling mornings is by setting up a DIY Breakfast Bar. 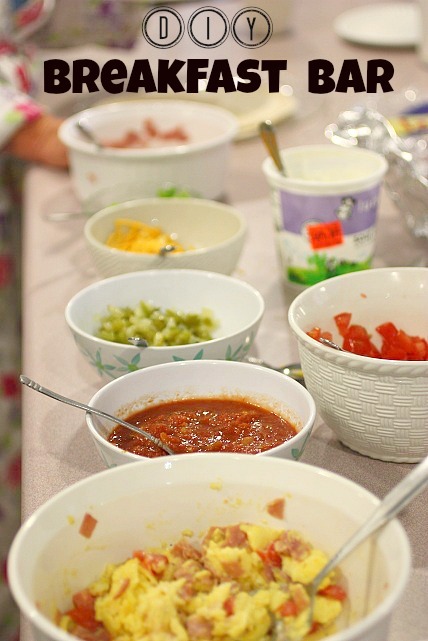 At our recent family reunion, I took the reigns of the meal making management and one of our favorite breakfast set ups was my Breakfast Burrito Bar. It’s perfect for large groups because with so many choices on the line, there’s typically something for everyone. 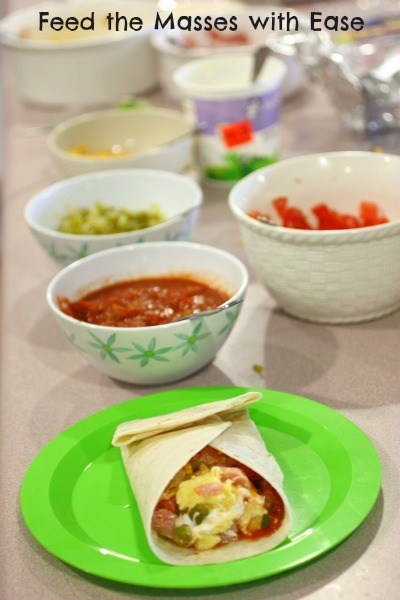 Whether you have children with picky palettes or young strapping teen men who want to conquer and compete over eggs, cheese and jalapenos burritos, everyone comes out a winner. Often people want to help me in the kitchen, but it’s easier to do it myself, well, with a breakfast bar, it’s perfect for the phrase “Many hands make light work.” A few people can help with the chopping, someone can line the cookie sheet for my cooking bacon in the oven life saver, while someone else preps the Yogurt fruit salad and my Copy Cat Cracker Barrel Hash brown Casserole. Since I love the creamy scrambled eggs that I make (no dry eggs for me), I cooked up four dozen eggs split between two pans. One was a plain pan of eggs with just cheese, and with the other skillet, I mixed in a lot of ingredients while cooking. Then we lined the island with all kinds of fun choices. Pick Your Favorite Ingredients for the Breakfast line. 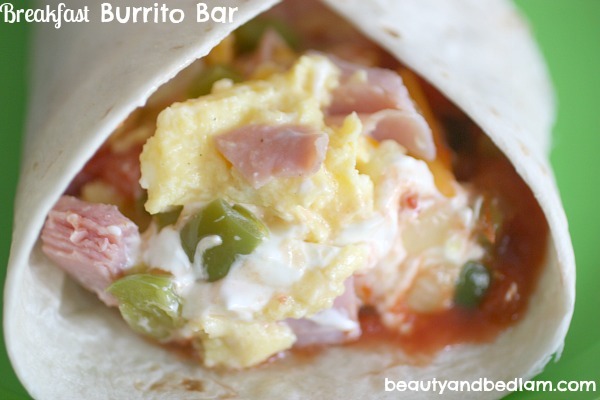 Trust me, a Breakfast Burrito Bar is perfect for your next gathering, and it allows the creativity to flow. Remember, friends and family just want to gather and share life together. They haven’t come for just “the food,” but with this breakfast bar, you can be assured they will leave having enjoyed every moment. Some of my other favorite “Bar” type creations are the Ultimate Baked Potato Bar and Build Your Own Pizza Bar. A “just for fun” bar for entertaining is my Coffee Bar. Yes, Coffee Lovers unite!! I can’t wait to hear what you do the next time you feed the breakfast/ brunch masses. Great idea, Jen. This would be good for us for the day after Thanksgiving. I’m totally doing this bar for our next mission meal. Thanks for the creative idea! Jen, I love your blog – you have such good ideas! 🙂 I am wondering how long your eggs stayed warm, if you had a warmer under them or not. We have a lovely dining area with a big buffet (a family heirloom, and it’s great!) and I put the boys’ breakfast items on there last school year. It was such a success, I’ve continued it this year – they’re old enough at 10 and 7 to get their own, make their own choices, and it frees me up to get their bags ready or pack lunches if we need to. From this picture, I didn’t. I wrapped the bowl in tin foil and it kept them warm for at least 45 minutes. For a longer period of time, I would definitely have them in a warmer with really low heat, and possibly stir in a tablespoon of warm milk every once in awhile just to keep them from getting dried out. You are reading my mind – guess what other bars I did during this family reunion. 😉 That post will be up soon. 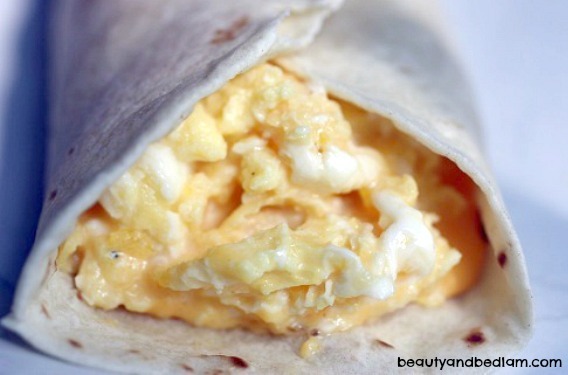 Can you share how you make your creamy scrambled eggs? Do you mind if I link and share this on a future Friday Findings Post on my blog for Women’s Ministry leaders? How fun this would be for a ladies breakfast/brunch! Excellent idea, and so much fun! I would not save this idea for just holidays…I would do this every time I had guest and not just for breakfast but for other meals…coffee/tea/hot coco/hot cider bars too! Dessert tables and everything in between….makes no sense to save this idea just for a holiday….it’s a great idea! I am going to use your idea for a breakfast bar for Father’s Day. Could you lead me to your recipe for creamy scrambled eggs? I can’t seem to find it. Thanks!